Ample parking space is available within 2 minutes walking distance in the adjacent parking garage. Valet is right next door. Hofbräuhaus Chicago offers exceptional, traditional Bavarian music nightly. Each month a new band from the Bavarian/Austrian European region performs. Hofbräuhaus Chicago diners can party, sing and participate with traditional beer hall music. 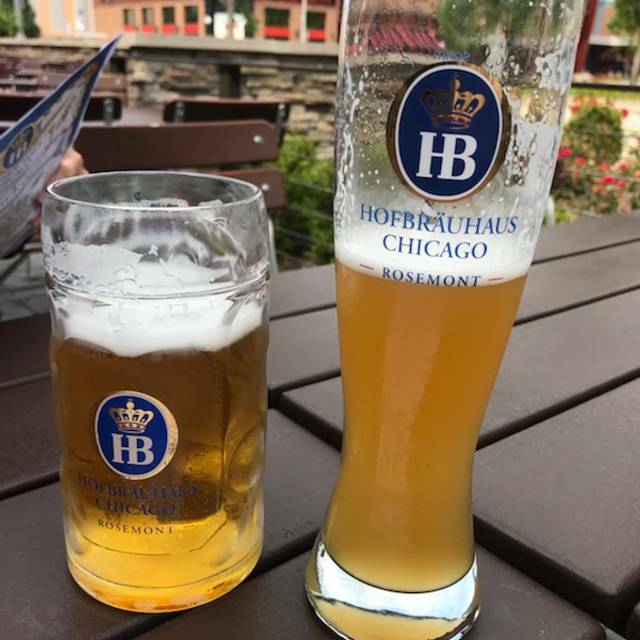 Hofbräuhaus Chicago is the first and only German micro brewery, beer hall, restaurant and beer garden to call Chicago home. 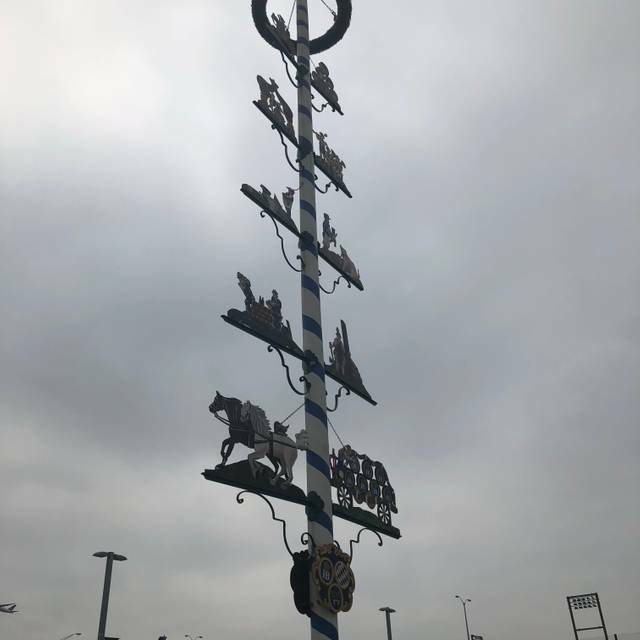 Modeled after the legendary Hofbräuhaus in Munich, Germany, it takes pride giving you an experience as authentic and unforgettable as the 400-year-old original. Guests can savor schnitzels, sausages, Sauerbraten and pretzels, and some ingredients are even imported from abroad. The freshly brewed beer follows the purity law from 1516 using original recipes handed down by the Duke of Bavaria over 400 years ago. With its beer hall (Schwemme), King Ludwig Room, and Biergarten in summer, it's Oktoberfest every day. Hofbräuhaus Chicago also features live music nightly with bands from Germany and Austria. In addition, you can take a piece of Bavaria home from the gift shop stocked with authentic and unique Bavarian gifts & collectibles. Bavarian white and red radishes with buttered rye bread and chives. Great starter and fun to eat! Much tastier with plenty of salt! Rich and malty, smooth and drinkable, finishes with a breeze of hops! Great food. Good entertainment. Fun times! I will definitely come back. Can get a bit loud toward the front by the band but great ambience and entertaining. It was so loud we couldn't even talk to each other. The food was okay but not worth what we paid. The beer was fresh and cold but the food was disappointing. If you want the ambiance of a German style Beirgarten with live music you won't be disappointed. 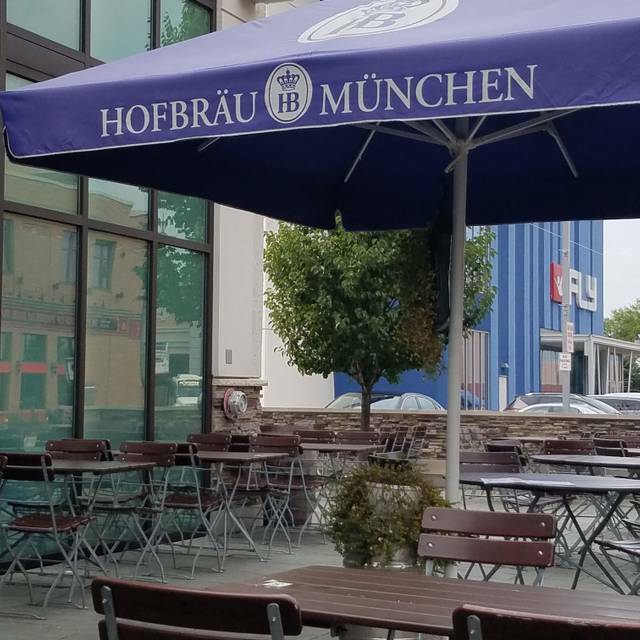 I’ve been to other Hofbrauhaus including the original in Munich. The food at this location was mediocre at best. The Sauerbraten with red cabbage was warm, not hot, and didn’t have a lot of flavor. The pretzel and Black Forest cake were both very good. Also strange but thru close at 11, our reservation was at 9:15. At 10:20 we were told if we were ordering dessert we needed to hurry as the kitchen was closing. We did. Then the light became very bright at 10:30 and they started flashing lights at 10:45. We decide to just leave. The gift shop was already totally closed. I’ve never been that “pushed” out of a restaurant before their closing time. Glad I went but don’t need to go back when I’m in Chicago. Too many places that are much better in town. Great place to take out of town guests. Very energetic and lively atmosphere. Excellent service and the food was outstanding. I came here all the way from Alabama and it did not disappoint! Breaded pork cutlet was extremely dry and crisp. I had to pay a $5.00 up charge to substitute mashed potatoes for the Bavarian. I don’t like Bavarian potatoes. There was no bread. No vegetables The prices were suited for a vacation location. We won’t return. Food was excellent. Selection was vast. Live music was great! 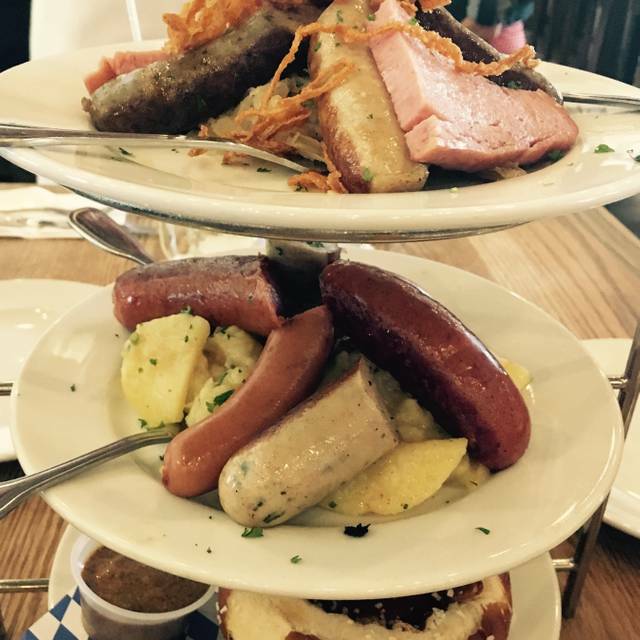 We enjoyed the efficiency of the wait staff and the overall party atmosphere of Hofbrauhaus. Being our first time here, I’m sure I’m missing something when I say I don’t understand why people who order shots are paddled. Is it an attempt to discourage people from spending money on shots? But onto the efficiency. In the past our group would routinely visit another one named establishment in this complex. Our group would all be seated even a few minutes before our reservation and WAIT 30-40 minutes for water. Then finally order our drinks and dinners and wolf down our food and run the 1/4 mile on a churning stomach to the theater. Not here. We were promptly seated, within minutes had water, not five minutes later we had our drinks, and placed our order which took about 7 minutes to come out. Yes I was timing it in order to compare to the other place where We Don’t Have to Care About Service. Drinks were fine, but the Friday night fish fry I thought was skimpy. The fish was lovely and light, hot and crispy. The fries were pale. There was no slaw or veggie option. The entertainment from the band was fun, the longhorn man came around to collect his tip, and we had a lovely relaxed time before having to leave to saunter over to the theater. Next time I will try some more traditional Herman specials. Those plates being served looked full of food and totally yummy. The atmosphere was great! They were way understaffed and the hostesses were so new all they could do was show you to a table. I also think they forgot to tell our waitress we had been seated since it took 2 min to see her. They have work to do on making sure everything is on the plate before it leaves the kitchen. How can you forget red cabbage with the sauerbraten? Like I said, fun music and atmosphere! Food was okay, beer was really good but get a big one you never know when they will be back for a refill! Food was good. Great place to celebrate a special occasion. 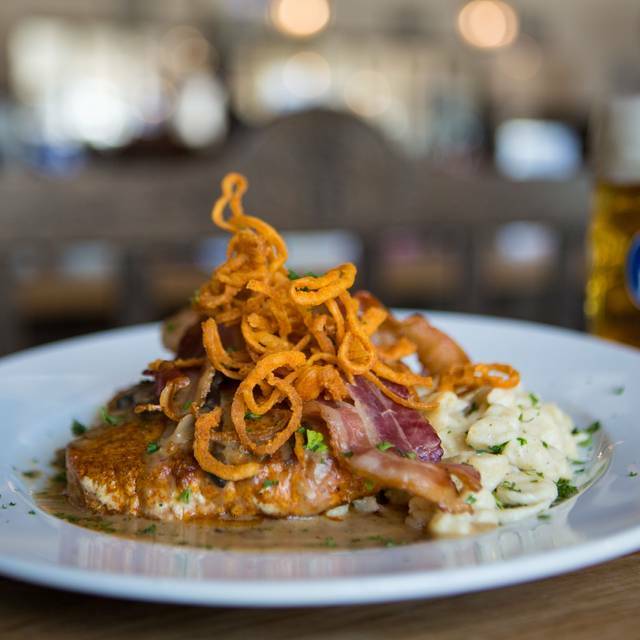 Authentic German cuisine with German music. We had a 7 p.m. reservation, we were seated by 7:10 pm. This was on Saturday 03/23/19. We had a great feeling that this was going to be a go-to restaurant for fun times. We saw people being paddled, a very good band and a lot of people smiling. However our waiter who took our order came back a half hour later. Only to say he forgot our drink order. After sitting there almost 45 minutes we received our appetizers and drinks. He took our order, only to say there's no substitutions and mentioned they may be out of my meal. They substitute my chicken for catfish. It was horribly dry, tasteless and very hard. I was very disappointed with the food, and the service. It’s a great spot for having fun, but the food is just okay. You kind of feel like your getting food at an amusement park. It was a fun place. The beer and pretzel were amazing, but that’s where it ended. Food was just ok. For the price, I wouldn’t go back. Food was OUTSTANDING. 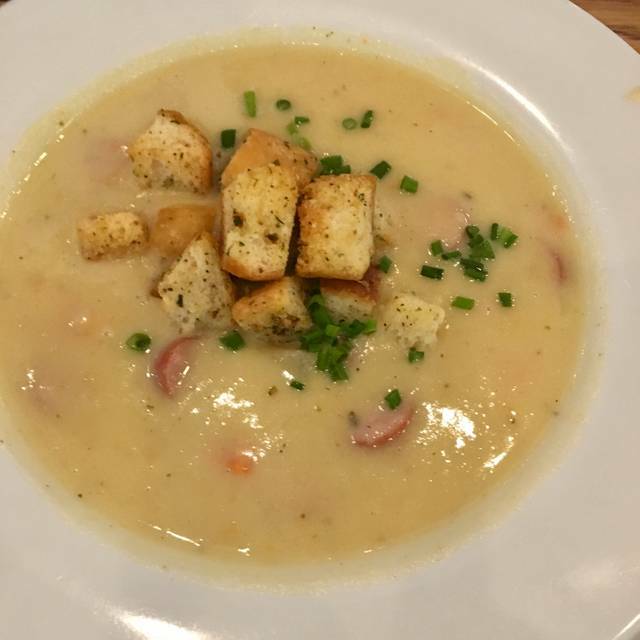 Exceed our expectations - we thought this would be gimmicky and so the food wouldn't be so great because you'd really come for the experience, but we were wrong! I would recommend this to literally everyone. The staff was super attentive and friendly, and even validated my garage parking which was awesome because like a dope I didn't realize there is free parking in front of the restaurant and used the $15 garage. (The area is difficult to navigate for those unfamiliar, due to construction.) The noise gets loud, but that is the experience at a place like this. The band brought out the Alphorns which were so cool to see! This place is ACES. Be ready for fun! Lots of authentic entertainment (it can be noisy). We sat at the bar and our bartender was very nice and knowledgeable. The music and audience interaction was great! However... No thank you to the paddle! I haven't done the "Chicken Dance" in forever! Great place to have a memorable experience! I'll be back! My boyfriend and I walked in to a live band playing and the place was just a party. I had never been to a restaurant with that kind of ambient before. Everyone was having a wonderful time and laughing. These are the kind of places that just take you by surprise in a really good way. Definitely recommend. Great beer, delicious food and fast service. It’s also a whole lot of singing along with the live band. Always a fun time and great for big groups! I have been there many times and never had a bad experience. Cool place but over priced. Service was nothing special. Very loud. Not a good place for a date if you want to talk. But great place for a fun rowdy time. We were disappointed in the food. Beer was good of course. My salmon burger was extremely dry. They beches and chairs extremely uncomfortable for people over 50 years of age. Way to pricey for what is provided. Will not be back here. My husband and I went out with another couple on a Friday night for their fish fry and had a great time. Initially the hostess couldn’t find my reservation. Once seated, after ordering I found what I wanted was only offered during the lunch hours. When I asked if I could sub in the chicken (which is what I wanted) for the pork I was told no, as substitutions were not allowed even though the chicken was available in a sandwich option (weird). The waitress however was very friendly and made the dining experience bearable. Hofbrauhaus will not be on my list of places I MUST visit again. Had a wonderful lunch with my grandma. We had the pretzel for an appetizer. I had a chicken sandwich with a pretzel roll and substituted spaetzel for the French fries. My grandma had the laberkäse with potato salad. We also ordered extra spaetzel. She felt like she was back in Germany! Great experience! They need more help waiting tables, our girl was hustling! She was great though with the amount of tables she had. 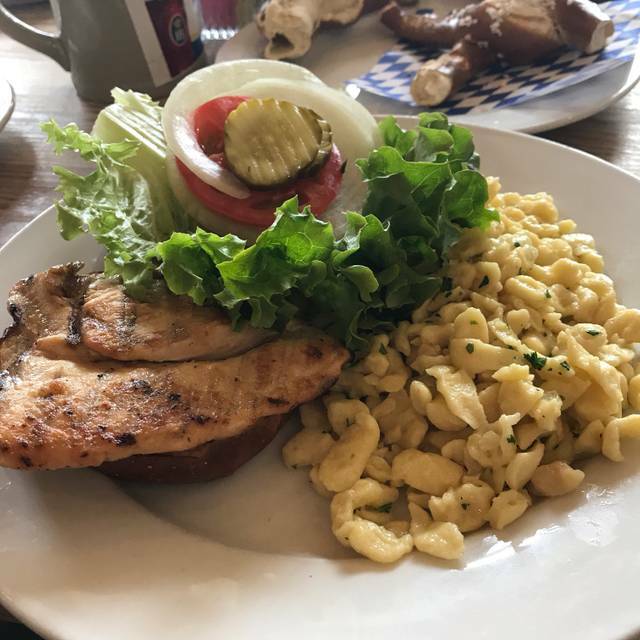 Food was delicious, good taste of German overall. Great entertainment! Great good and atmosphere! Definitely need to come back! The food was delicious but the waitress we had was really inattentive. Someone else ran our food out to our table and then left before we could even stop him - and we sat without silverware for at least 5 mins. Waited what felt like forever for new beer and I didn’t even bother trying to get a second water. We ended up asking for the check immediately and paid halfway through dinner because we had a concert after and we didn’t want to leave it up to her to be quick about getting us out the door after we finished eating. That said, atmosphere was fun and food was great as always. The food was delicious, the atmosphere also fantastic. Live entertainment was decent. The service was a bit slow. It was probably an off-night. We took some friends who had never been to this Hofbrauhaus, but were at the one in Munich. We had told them about the entertainment in advance, and we were all looking forward to the usual German music, sing-alongs, and such. But we were disappointed when it all came to an abrupt end at 8:00pm to be replaced with American music covers. The night started out badly, because we were seated at 7:20, but our server didn't even take our first drink order until 7:40. She acknowledged our presence perhaps 10 minutes before that. My wife noted that her Jagerschnitzel didn't have the same taste that it had serveral times previous. 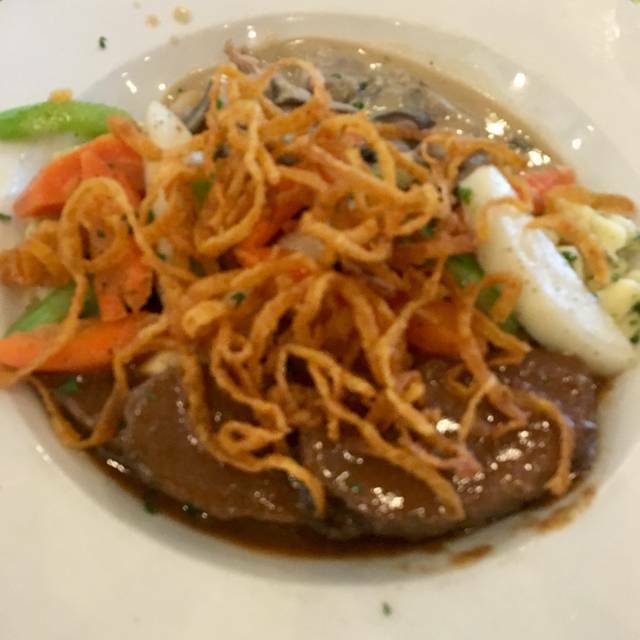 Our guests either had Sauerbraten, or the combination of Sauerbraten/pork, but they both commented that the Sauerbraten wasn't that sour. After my wife commented to the manager about the American music and the slow service, we were comped one round of drinks with an explanation that the German 'experience' usually ends at 8:00pm. We've had several good experiences with great food and the German experience in the past, mainly because our reservations for the two of us were earlier. My wife apologized to our friends a few times for the disappointing night. We've learned our lesson about getting there too late. There was no excuse for the slow service though, when the server's section wasn't that busy when we arrived. 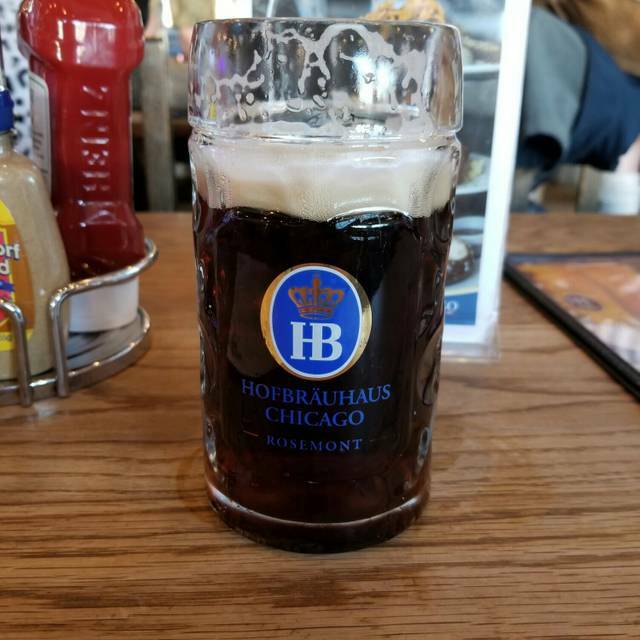 ---- I will still recommend Hofbrauhaus to a friend, as long as they get there well before 7:00pm. Enjoy the beer and food . . . Stay for the Gemeinschaft.